The Boomerang can be considered one of the most accessible electric bicycles ever, making riding more fun and easy for everyone. The Boomerang features a 9" step-through frame that allows easy access for those with knee, back, or hip problems. If you also have some joint problems, you'll appreciate the geared motor that excels at acceleration and hill climbing. You'll find yourself naturally cruising upright in a straight position with the wider handlebars. The Boomerang can be upgraded to Balloon Package tires, belted with Kelvar and an upgraded saddle and grips. The Pedego Boomerang is a great alternative to those who are looking to bike without having to do a majority of the work. The Boomerang is great for those with joint problems as well as anyone looking to cruise longer than normal. 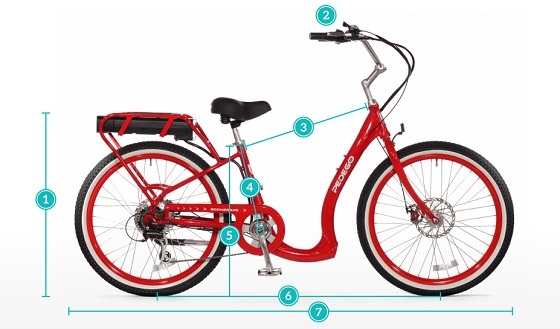 The step-through frame allows an easy way to get on and off the bicycle without having to strain muscles while the saddle and wide, swept-back handlebars that allow comfortable riding. The battery is lightweight and long-lasting, with a three-year warranty, and the SRAM disc brakes allow safe and reliable riding. The City Boomerang has the option between a 36V 10Ah and 15Ah or 48V 10Ah and 15Ah battery. The 36V 10Ah will be the standard, and typically provides more than enough power and range (while also being the more affordable option). The 15Ah offers an extended range and is great for trips over 20 miles, or if you plan on using the battery heavily (by hardly pedaling). 23 in. 27 in. 47 in. 74 in.